In the wave of development that reshaped St. Johns County a generation ago, new residential communities were regularly paired with new golf courses. But the current wave of development that is slated to house tens of thousands of new residents doesn’t include plans for houses along fairways. For the time being, the county that plays host to one of the biggest professional golf tournaments and houses the PGA Tour headquarters and the World Golf Hall of Fame is not adding any golf courses. There will be thousands of new houses — with the county issuing permits for more than 1,700 so far this year — but no new golf courses. Why are there people flooding into the county but no new golf courses are being built? They simply aren’t needed. Instead of golf courses, developments are opting for water parks, kayak launches and bike trails. 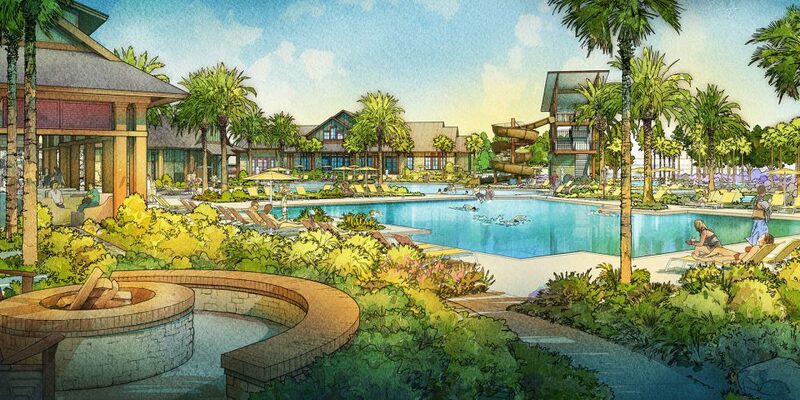 Andy Smith, regional development manager for Freehold Communities, said his company looked at its choices in putting together amenities for Shearwater. That development near County Road 210 will include up to 2,600 homes spread over 1,500 acres. Smith said previous developments in the area already provide ample opportunities for golf, so there was no reason for Freehold to build another course. On C.R. 210 alone, there are courses already built in Cimarrone, South Hampton and St. Johns Golf and Country Club. And there’s also Julington Creek Golf Club to the north and the Slammer & Squire and the King & the Bear to the south. “We studied the market and found that there are plenty of great courses open to the public within the submarket that would fill the need of our buyers who want that experience,” Smith said. Freehold isn’t the only company to reach that conclusion. The RiverTown development by Mattamy Homes in the northwest is approved for 4,500 homes. Its website boasts of hiking trails and river amenities and has photos of people swimming and playing tennis, but there’s no golf. To the east of Interstate 95, Twin Creeks, which will end up with as many as 3,000 homes, has put together a deal with a company called Crystal Lagoon to build what is essentially a giant swimming pool and artificial beach. But there won’t be any greens or fairways. Kinsey said he enjoys golf course communities and lived in one for more than 20 years. But he said demand for that lifestyle is waning, and other developments in the area already do it well. In fact, he said it would be hard to compete with the many options already in St. Johns County. “They’re all fabulous places,” he said. Roger O’Steen, founder and chairman of the PARC Group, has overseen the planning of two major developments here that have taken two distinctly different directions. In 1986, he opened Marsh Creek Country Club in southern St. Johns County. The project eventually included 670 homes and a well-respected golf course. But in the early 2000s when he worked on building Nocatee, a massive community in the northeast part of the county that’s adding about 1,000 homes per year, O’Steen followed a path like Shearwater and chose not to build a golf course. That’s especially true in the northeastern part of St. Johns County, where there are two championship courses in TPC Sawgrass and two top-notch courses at the Ponte Vedra Inn and Club, among other choices. There are also several courses just across the Duval County line. Much like Freehold, O’Steen’s company came to the conclusion that more buyers — many of them active families — wanted something other than golf courses outside their doors. Just because developers aren’t building new courses, it doesn’t mean the game is dying out. There is still a large contingent of people who enjoy a country club lifestyle that includes regular tours around the links. And although golf isn’t enjoying the kind of growth it did 20 years ago with the emergence of Tiger Woods and the excitement he generated, the game still has plenty of followers. According to David W. Reese, president of Florida’s First Coast of Golf, there were 72 golf courses in North Florida two decades ago, and now there are 68. Only one that closed was in St. Johns County, the revered Ponce de Leon Golf Course. That course was closed for purposes of real estate development — a project called Madeira. A 2016 report from the National Golf Foundation said participation numbers slipped in 2015 to 24.1 million from 24.7 million the previous year. It also said there were 2.2 million beginners in 2015, the majority of them millennials. Reese said North Florida has actually seen an increase in play, which makes sense because both population and visitor numbers are rising. According to the National Golf Foundation, Northeast Florida is the top region for golf in the state for 2016 and all of 2015 throughout the eight regions of Florida. Golf remains a large part of the local economy, especially in regard to tourism. In 2015, Reese said St. Johns County saw 60,662 out-of-town golfers who played 194,116 rounds and occupied 82,499 room nights. Based on the numbers Reese is seeing and other happenings in the business world, indications are that the golf market right now is solid, if not expanding. While new ownership of Oak Bridge Country Club (formerly Ponte Vedra Golf and Country Club) is proposing a downsizing of its course, other communities are seeing different kinds of improvement of their courses. For instance, The Plantation at Ponte Vedra Beach is in the final stages of its $6 million-plus renovation, and it will reopen in the fall. The Players Stadium at TPC Sawgrass is also being refreshed and will reopen in November. So there aren’t signs that a lot of courses are going to be closing soon, but it’s also likely that there won’t be many additions in the near future, either. In the meantime, O’Steen said he thinks golf communities like Sawgrass, The Plantation, Marsh Landing and others will only increase in value in the coming years as other developments go in different directions. And the market could eventually swing back in favor of those kind of communities.